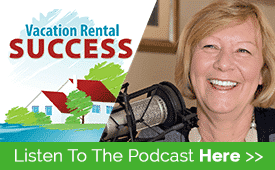 I’m curious to hear how many owners have experienced requests, or even demands from their guests for services that we would not expect to be provided in a vacation rental. I recently heard of a few incidents of guests seeming to believe they were in a resort or hotel, asking for items to be delivered or a minor repair carried out. The first was a call to a caretaker saying there was no hairdryer supplied and could one be delivered ‘as soon as possible’. Second, was the message left for an owner that a light bulb required changing in a hallway and that it was OK to let himself in as the family would probably be on the waterfront, and he need not disturb them. Finally, an owner of a fairly remote Ontario cottage was blown away by the family arriving from Saudi Arabia, whose first question on arrival at the property was “Where’s the food?” Their version of a vacation rental apparently included fully stocked cupboards and refrigerator. While we can shake our heads in disbelief, it’s also important to be aware of the nature of expectations and how the rising popularity of our style of vacation accommodation is bringing a new generation of rental guest to our doorsteps. We have long been used to guests experienced in renting a vacation home each year; those who accept the quirks and oddities of self-catering, and who enjoy the freedom and flexibility that rental brings. However, as more and more newcomers are being wooed by media reports and articles – those showing how celebrities are turning to rental properties to find more privacy are a good example – we should be aware of the expectations that are being raised and think of ways to inject a dose of realism without turning off the wave of interest. Ensure the property is fully equipped so ‘call-outs’ should not be necessary. A hairdryer, spare light bulbs and a stepstool are essential items in my book and not providing essentials is likely to trigger service calls of one sort or another. Write a page on your website or blog describing the differences between hotel/resort accommodation and self-catering. Talk about the great benefits – space, privacy, a home-from-home environment with a well-equipped kitchen; not having to share a waterfront or boats….you know the advantages, so set them out. Then you can humorously mention the ‘drawbacks’ – like having to change the occasional light bulb or drive out to get some more milk. Make it clear in your Welcome Guide who your guests should call “in case of an emergency”. It wouldn’t be fair to tell them to only call under those circumstances since they may have questions or concerns that need an answer, however, there are ways to get this across. 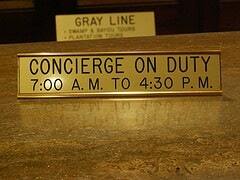 If you make your Guide really comprehensive, the time taken over this will pay back in reduced service calls. Tell them where they can go to shop, eat, and find local attractions, and provide a wealth of local tourist information. If you don’t meet your guests, make a quick call to them on the morning after their arrival to check if they have any questions. Then you can tell them it’s OK to call you with additional questions before a set time – say 6 pm. This will prevent the 11pm panic call because they can’t figure out how to make the microwave work! Though Sanibel has no oil spill, the inquiries and bookings are off their usual robust path and more people are looking for discounts as a result, but I have not noticed any more “expectations’….outside of the discount request! Agree its a great idea to write a note on your site, or as part of the welcome note include details of where emergency things are, and who to contact. We are not at the property ourselves whilst the guests are here, but have a great network of people who can help if our guests do require something. We’ve had requests from batteries in remote controls, light bulbs, hairdryer, and also increase in wireless broadband access as they were using up our full limit in a few days! Im always of the opinion that speaking to the guests to understand what their needs are and coming to a compromise is the best option, and for the minute details, put them all the booking terms and conditions that you can send to them along with the booking. Then you are covered! This is a great post Heather. While I’m not a owner I can share my view as a renter. We once stayed in a rental that didn’t have a website and each time I suggested the owner get one their first response was that they “already have enough business and couldn’t handle more” and they wanted to move the conversation on to something else. Over the weeks we stayed there I noticed the owners made a lot of trips back and forth to the rental and answered many questions multiple times from potential and current renters. To me it was clear they could have greatly benefited from having a website answering common and uncommon questions. Some things I wish I would have known before we rented were about; what renters provide for themselves, no heating during certain months regardless of weather, what the weekly cleaner actually cleans, etc..
Great post Heather – it’s about understanding that not all guests know that a vacation rental is a very different proposition to a hotel. 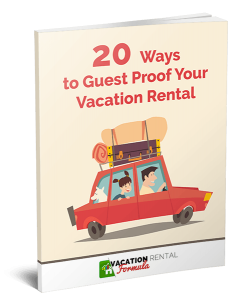 What we’re all seeing is an increase in vacation rental popularity and of course those guests have only previously experienced a hotel service. It’s good food for thought for our own website and I think you and Sean make the same point – be more transparent on your listing page about what you do and don’t offer. I think it’s hard because the nature of VR’s mean that some owners will provide more than others. But than in itself places an obligation on the owner to be clear.